The One Glove Nova Patriot is an exclusive SMU designed by Keeperstop and One Glove Co for 2019. This awesome US themed glove has amazing grip from the white contact latex. The glove features removable 5 finger protection for the ultimate in customizable support. The red white and blue neoprene backhand is breathable and comfortable. It is paired with a transparent silicone punch zone showcasing our beautiful stars and stripes design. 4mm White contact latex palm for the ultimate grip in all weather conditions. This super tacky latex will surpass your expectations! Yes, 5 finger removable finger spines. The velcro closure keeps the spines secure when in use, but also makes it a breeze to remove them if desired. Removable spines in the backhand also allow for customizable support. 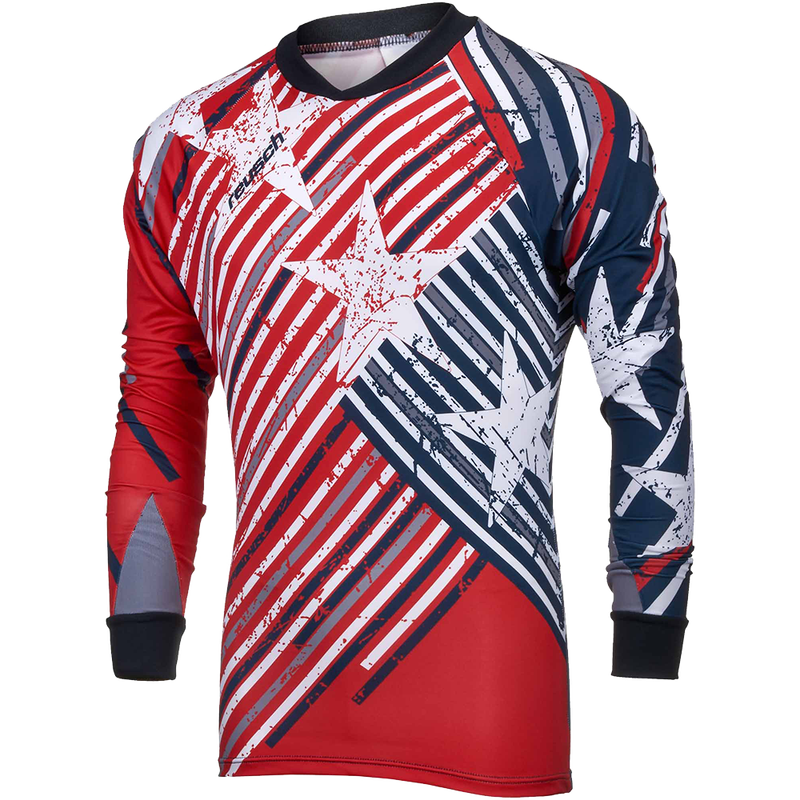 Keeperstop and One Glove teamed up to produce the wonderful sublimated neoprene glove body featuring the US Stars and Stripes. The Red White and Blue neoprene glove body is beuatifully paired with white latex and clear embossed 3D punch zone for excellent protection. The US stars are beautifully presented under the 3D punch zone. We wanted to make the most patriotic US glove ever and we feel the backhand design has captured our vision perfectly. Cresco Hybrid cut. This is a stitch-less expanded roll finger hybrid cut. The aggressive angles, design and high gloss detailing slot together sublimely to produce an incredible looking glove. The glove also features a v-notch insert between the thumb and index finger to prevent tear out in that area. New "MidSplit" strap combines the comfort of latex straps, with additional adjustment for fans of elasticated stretch straps - the best of both worlds. The strap also features a rubber tab for easy adjustments during the game and a printed US flag on the palm side of the strap. Any US loving Patriot goalkeeper out there! Game level latex and performance! This limited release SMU is a special project from Keeperstop and One Glove. We love the way One Glove has put our vision into this glove. Show your US pride on the field with the Nova Patriot! He has played 2 games in these. He is 13 years old and 5ft 1in some what a small frame. He said he likes the gloves but the fingers fill a bit tight. He has never had this brand but is getting used to them.